The Rio Grande Valley will warm up the next two days, according to the National Weather Service in Brownsville. High temperatures for Thursday are expected to range from 73 to 76 degrees. On Friday, some areas may hit the lower 80s. A cold front will arrive on Saturday, bringing a chance of showers, mainly for the coastal areas. 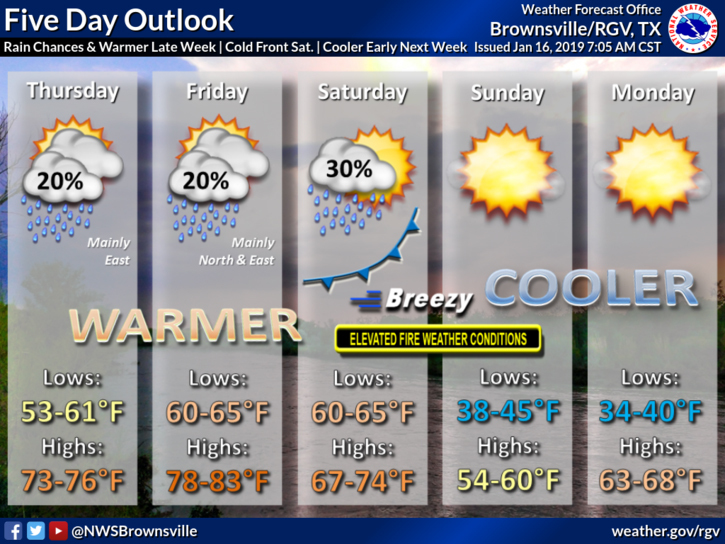 Breezy conditions will also accompany the front, which will lead to elevated fire weather concerns late Saturday and Sunday. You can also expect to start seeing much cooler temperatures Sunday into the start of the next work week. On Sunday, temps will range from 54 to 60 degrees with lows in the 30s in some parts of the region. Monday will see highs in the 60s with lows also in the 30s.